Valspar Paint announces the second installment of the Valspar Color Project, an online video series following two of today’s favorite celebrity couples, Tori Spelling and Dean McDermott as well as Ashley Hebert and JP Rosenbaum, as they take viewers behind the scenes to share how they connect to the power in color and find the perfect Valspar paint color match to transform a room in their homes. With the help of interior designer and Valspar color expert Genevieve Gorder and the Valspar Perfect Match App on Facebook, each couple reveals how they merge their color styles. Beginning Tuesday, March 19 through Monday, June 10, 2013, watch each video on the Valspar Paint Facebook page at www.facebook.com/ValsparPaint. Each time a viewer shares their own color match through the app, Valspar Paint will donate $1.00 to the nonprofit affordable-housing organization Habitat For Humanity, up to $150,000. 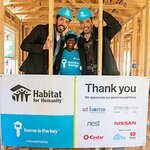 Habitat for Humanity is proudly supported by each celebrity couple and by Valspar as its national paint partner in the United States. Actress and author Tori Spelling and her husband, actor Dean McDermott, turn to Valspar Paint and Genevieve Gorder to advise them on the perfect color match after deciding to refresh their kids’ playroom in their Los Angeles home. Gorder pairs Spelling and McDermott with Valspar Rushing Stream 5005-10B, a bright and modern shade of turquoise that reflects a combination of both their color tastes and personalities. After using the Valspar Perfect Match App, TV personality Ashley Hebert and her husband, JP Rosenbaum, were matched with Valspar Roasted Pumpkin 2005-3A. This rich shade of orange fulfilled their desire to add a dynamic vibrancy to their living room, a common area where they often entertain and host guests. Now in its second year, the Valspar Color Project is part of an ongoing partnership between Valspar and Habitat for Humanity. Since launching the national partnership in 2002, Valspar, through its Foundation, has committed more than $60 million in cash and paint to Habitat through 2014 and guarantees paint for every Habitat house built, repaired or rehabilitated in the United States. To watch the Valspar Color Project celebrity color transformation stories, use the Valspar Perfect Match App and share a color match to help raise money for Habitat for Humanity, please visit www.facebook.com/ValsparPaint. Through the Valspar Color Project, for each share of a color match between Tuesday, March 19 and Monday, June 10, 2013, Valspar will donate $1 to Habitat for Humanity, up to $150,000 and with a minimum donation of $25,000.